The first test plate through the Fornidar depicts Grandad's tools. They hang unused in the shed, ivy and the neighbours flowers invading the shed through gaps in the old leaded window. 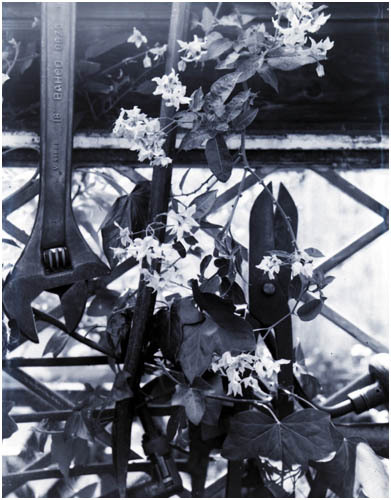 The camera has performed well enough, this image was better in colour, the rusty tools contrasting well against the blue flowers and vibrant young ivy growth. It has given the camera a clean bill of health though, and no leaks in the two surviving plate carriers. The plates are developed in a period tin tank, originally intended for quarter plate, these 9 x 12 cm sheets were cajoled in with a bit of flexing.